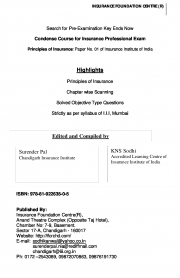 Description of "IC 01 Principles of Insurance (eBook)"
This (objective type book Licentiate level exam) has been prepared for candidates appearing in Insurance professional Exams including simplified notes. This book can also be useful for candidates appearing for Brokers, Surveyors and other insurance professionals. Practice questions have also been introduced. This book contains more than 1000 objective type questions to help the candidate for testing and self-evaluation. More than 35 years of experience imparting Insurance Education. Reviews of "IC 01 Principles of Insurance (eBook)"